Marshall Babies are not only adorable and super cute, they are bred to be very gentle and docile compared to the other breeder’s ferrets. Every ferret has been hand raised and is eager to be held. Marshall babies come in a rainbow of colors – from traditional sable, siamese, silver mitt and albino to sterling, panda, champagne, chocolate, blaze, black-eyed white, marked whites and more. 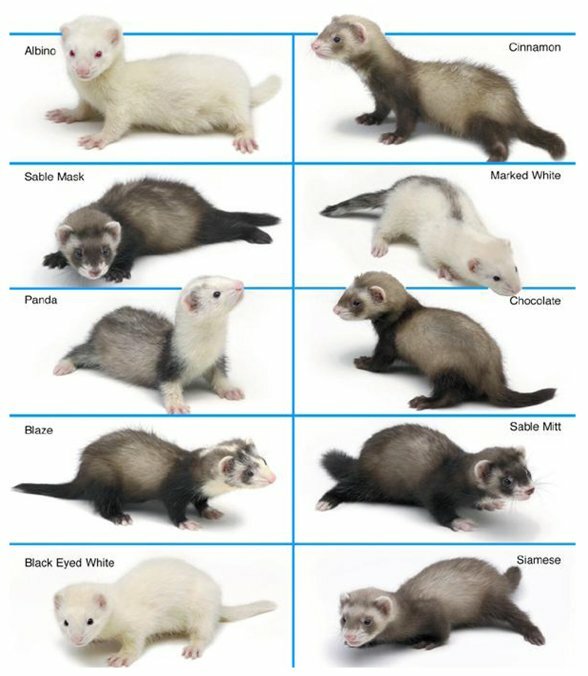 View the Marshall Ferret Pattern and Color Chart below. Marshall Ferrets are available every week, all year long. They are shipped at 8-9 weeks of age to authorized pet dealers throughout the United States and abroad. Before they leave our farm, they are given a final health check and plenty of food and water for the trip. To avoid pet overpopulation and prevent health problems, every Marshall Ferret is neutered (spayed/castrated) and descented before being shipped. Two tattoo dots on the right ear identify that these procedures have been performed. By neutering our ferrets, problems that occur during normal mating season are avoided. Every Marshall Ferret receives a canine distemper vaccination prior to shipment. We highly recommend additional vaccinations at 11 and 14 weeks of age and then annually. Rabies vaccinations are recommended after 12 weeks of age and then annually. It is extremely important to keep your ferret’s vaccinations current, otherwise your ferret is susceptible to contracting serious illnesses, such as distemper or rabies. Click here for Marshall’s Health and Vaccination Record. Distemper is an airborne virus that, without vaccination, is almost always 100% fatal. Distemper can be contracted from a variety of surfaces and sources; i.e. grass, weeds, trees, shrubs, or animals that you come into contact with. The incubation period can be up to 10 days long, so it is important to isolate any new pets from the household until such time has passed. Some people believe that if they always keep their pets indoors they will never be exposed to distemper. This simply isn’t true, because any time you venture out of your house and back in, you carry all sorts of germs on your shoes and may indeed be exposing your pets to deadly viruses. It is best to vaccinate. Every Marshall Ferret shipment is accompanied by a USDA Veterinarian Health Certificate and a baby ferret guarantee card. The Marshall guarantee certifies that the ferret is neutered, descented and covers congenital health problems for one year. To validate the ferret guarantee, you must register your ferret online at marshallferrets.com. After registering your ferret, you will be able to print out your Official Marshall Ferret Birth certificate for your new pet. Remember, when considering a new pet ferret, Marshall Ferrets are the most gentle and cute and available in a wide assortment of colors. View the Marshall Ferret Pattern and Color Chart.